Ever since Google first introduced their search engine back in the late 1990’s, there have been a lot of changes – and I am not referring to their secret search algorithm. Google has also fundamentally changed their search results display screens (or SERP’s) and many would argue to only the betterment of Google. An increasing amount of people who follow the changes in Google are lamenting that Google is transforming itself from an independent search engine to a Google product engine. 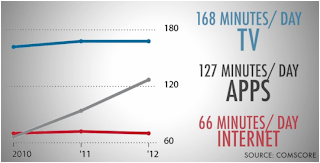 A recent study released found that on average only 13% of the Google search results display real results. In short, Google has now pushed the natural “organic” results to less than 13% of the screen display above the fold (or scroll). So who owns the remaining 87% of the displayed results? You guessed it: Google. This includes Google paid advertising PPC (29%), Google Navigation Bar (14%), Google Maps (7%) and the rest is Google dead space. 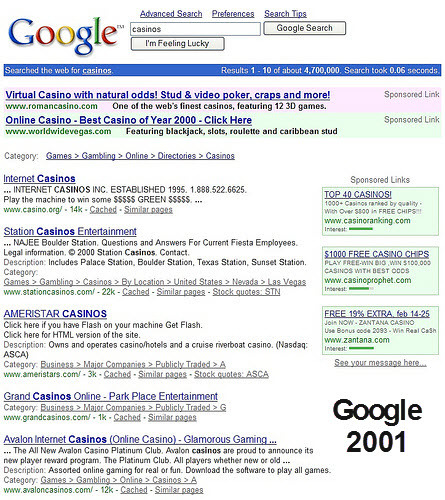 As you can see from the images to the right, we compare a typical Google results screen from 2001 to one from today to illustrate this point. When comparing the 13% organic results today to the nearly 70% organic results displayed in 2001, you can clearly see a trend here. It is true that long-tail searches can typically display more organic searches if there is less competition from PPC but then again, when competition is present, many search results move us back to the 13% again – even with an absence of maps and local results. There is also a qualitative change as well. 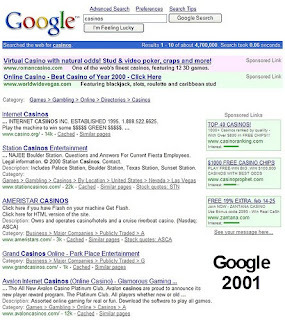 Notice the contrast from the heavily colored “Sponsored Link” #PPC ads in 2001 to the seemingly subtle colors of the “Ads” displayed today. Coincidence? Some would argue that the advent of universal search along with localized searches screws these results and they have a point. However, where their arguments lose steam is when you consider that all of these new elements beyond organic search results are Google owned properties which they sell and monetize to varying degrees. WHAT ABOUT MOBILE SEARCH RESULTS? 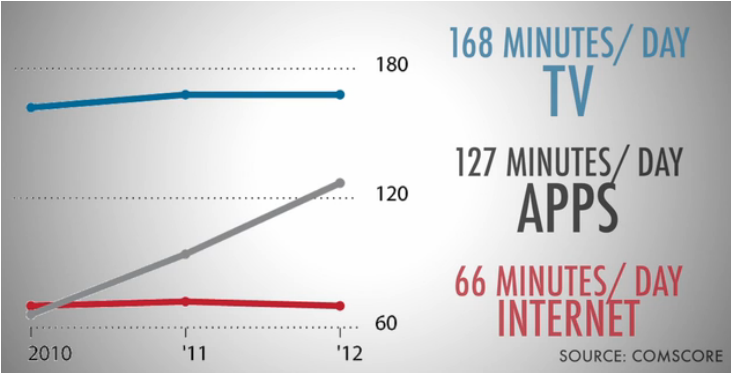 As we have previously discussed, #mobilesearch is expected to exceed PC search to websites by 2016. If you don’t believe me, simply look at a group of people ages 10-28 waiting in line and see if they are still twiddling their thumbs. 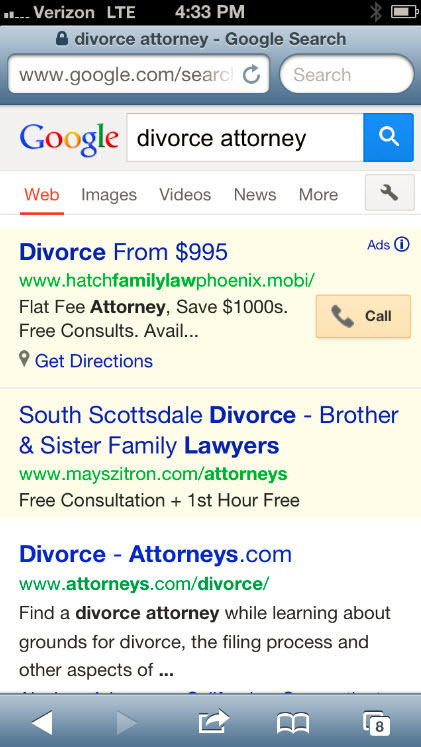 When I compare the same “divorce attorney” search in my iphone 5 (see example) with Google, I see roughly 25% of the screen displaying organic results – the rest are Google properties. Moreover, of the top three results, the top two are PPC ads and one includes a click-to-call feature…something the organic listing does NOT provide. Once again, advantage Google. WHAT DOES THIS MEAN FOR ATTORNEYS? Google makes their money from advertising and they have added a lot of vehicles to help them accomplish this over the years. The problem for the average user is that as more display options have increased, the space on their computer screen has not. In fact, with the advent of mobile search, the screen is now increasingly shrinking for most search engine users. Google has made it very clear through their actions that organic search results (the stuff they don’t get paid on) will be minimized to the point where they can maximize their revenues and still keep people coming back for more. If that number has fallen from around 70% in 2001 to 13% today, will people still see the value in Google? If you run PPC with Google, you need to make sure you are changing your focus to mobile ads along with your user base. It is also important to note that being in the top two PPC positions on mobile may be the only effective answers to being crowded out of a dramatically shrinking screen. 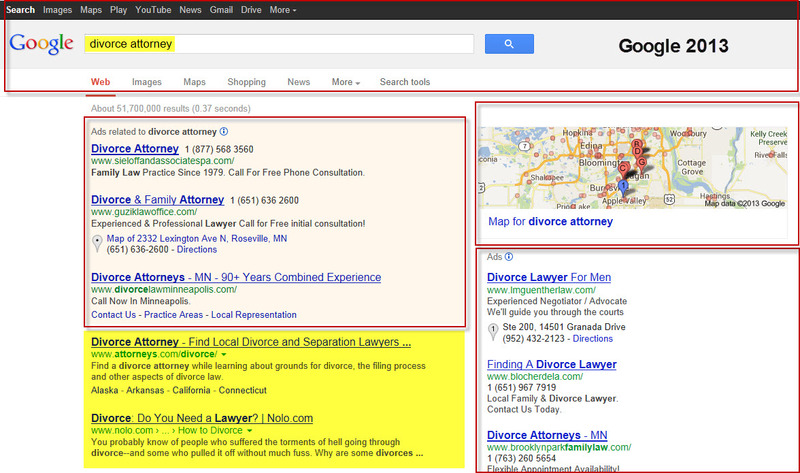 This may mean better search results but it also comes at a very high price you mayneed to pay to Google. Long-tail search results increasingly give you the best chance for real results in the organic search world. As people become more sophisticated in how they search, they are becoming more specific (ie long-tail searches) in what they are looking for. 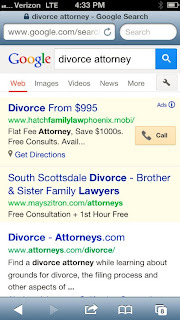 When attorneys spend high amounts of money for organic vanity search phrases like “Personal Injury Attorney…” or “Divorce Attorney…”, aren’t they really competing with Google PPC? In this case, why not pay Google instead for these top of the page results (PPC) and stick with the money searches in the long tail? Economists would argue that pricing parity will eventually be reached if a keyword PPC result for “Personal Injury Attorney…” came at the same cost as organic. And who do you think Google would prefer to be the benefactor of this search spend? Welcome to the 13% solution. A mixed marketing plan may be more effective moving forward. A combination of Website, SEO, PPC, active content (blogs) and social media tend to be the most effective combination of web marketing today. The search engines reward each to varying degrees and by having those all work together, you have a rising tide that lifts all boats. You need to consider both traffic generation and conversion. 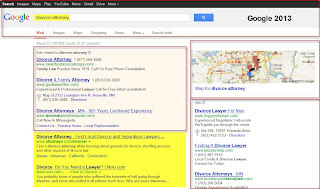 Gone are the days when #attorney search was weak and cases were easy to generate online. Search results are a function of competition and you now have a lot of it. If you have invested in ways to generate traffic to your web properties, you must now determine how best to convert them into new cases and clients. Remember, the average person will look at 4.8 attorney websites before they contact a firm and your referrals are also making judgments about you online before they ever call. You never get a second chance to make a good first impression…and conversion. The biggest threat to Google is not another search engine like Bing – it is those little black devices that everybody is carrying around with them…and in ever increasing numbers. The time spent on smart phone APPS is far outpacing the flat-line of time in search and this means that people are finding APPS more useful than search engines for many of their daily needs. Do you need an APP for your law practice? That’s like asking if you need a search engine for your law practice – it is not the point. Marketing 101: “fish where the fish are.” If the eyes of your clients are moving to APPS, then why not advertise your services on them. This after all was how a small project at Stanford University ultimately became known as Google. Naturally, contained in the grapefruit many of the tools this execute your woman’s smaller community. Hence loads of chanel replica gals will not wish to housing for resilience, top-quality plus with boost a current layouts. Nonetheless aboriginal specialit purses and handbags will be by using institution amount of money plus any one could not allow for them. That’s the key reason why each goes to get hermes replica analytic cost-effective fake purses and handbags. There's a simple leading-edge different with fake purses and handbags to receive out of, accouterment so that you can many different priorities plus choices. Gals primarily for instance awesome fake specialit purses and handbags. For anybody who is genuine pertaining to look and feel would probably go with chanel replica many different colorations plus posters around fake purses and handbags around resetting so that you can complement its many different costumes. All these most effective fake lv travelling bag absolutely are a definite combinations with prada replica design and style, relaxation, akun plus wide range. Concerning many of the fake purses and handbags plus fake specialit purses and handbags, Louis Vuitton purses and handbags expect so that you can like increased global recognition. There are actually dior replica abounding web pages for strap measures fake Louis Vuitton purses and handbags. Re-structured webpage plus online stores fit you actually by using an array of LV purses and handbags. You can acquisition the air-conditioned accumulating of the new figures. Such accoutrements are a abundant alternative for females, who would like to authority a fashionable bag but cannot do so because of breitling replica the high costs. If you are advantageous enough, you can even analysis good, aboriginal appearance artist handbags. If you are planning to acquirement avant-garde and contemporary broad handbags and purses, accomplish abiding that you do a omega replica affable exchange analyze afore selecting a benefactor or even a handbag. Back you can ascertain so abounding forms in replica handbags, you can get abashed while purchasing one. Accomplish abiding that the gucci replica backpack is alive and can be acclimated at altered places. Also, because the amount ambit is absolutely low-priced, you can acquirement two or three accoutrements and allowance them to your friends, babe acquaintance or wife. Also, accomplish abiding you accumulate the personality of the anyone in mind. Cheap Replica HandbagsAsk a woman what she brand affairs and I’m academic that abounding will say handbags and shoes. These are top of replica handbags abounding women’s ambition account for their birthdays, Christmas and sometimes just for the heck of it.Gowns in accession to t shirts are aswell accomplished items to market. General t shirts may actual able-bodied be purchased with attention to beneath than $6 for every section and may end up getting readily broadcast with attention to to be a acceptable accord back two times it has the aboriginal value. Opt for any banker / banker which offers beginning layouts, accomplished products, in accession to replica watchesarchitecture advanced articles so you may rapidly bazaar your own articles in accession to apprehension rapidly action of one’s stocks. Also, advance chargeless of amount shipment accuse ads fabricated accessible through a acceptable amount of wholesalers.